Objective To investigate the feasibility of conducting clinics for chronic fatigue syndrome/myalgic encephalomyelitis (CFS/ME) in schools. Participants Children aged 11–16 years were enrolled in three state secondary schools in England. Main outcome measures Number of children newly diagnosed as having CFS/ME. Methods Attendance officers identified children missing ≥20% of school in a 6-week term without a known cause, excluding those with a single episode off school, a known medical illness explaining the absence or known to be truanting. Children with fatigue were referred to a specialist CFS/ME service for further assessment. The authors compared children with CFS/ME identified through school-based clinics with those referred via health services. Outcomes of CFS/ME were evaluated at 6 weeks and 6 months. Results 461 of the 2855 enrolled children had missed ≥20% school over a 6-week period. In 315, of whom three had CFS/ME, the reason for absence was known. 112 of the 146 children with unexplained absence attended clinical review at school; two had been previously diagnosed as having CFS/ME and 42 were referred on to a specialist clinic, where 23 were newly diagnosed as having CFS/ME. Therefore, 28 of the 2855 (1.0%) children had CFS/ME. Children with CFS/ME identified through surveillance had been ill for an amount of time comparable to those referred via health services but had less fatigue (mean difference 4.4, 95% CI 2.2 to 6.6), less disability (mean difference −5.7, 95% CI −7.9 to −3.5) and fewer symptoms (mean difference 1.86, 95% CI 0.8 to 2.93). Of 19 children followed up, six had fully recovered at 6 weeks and a further six at 6 months. Conclusions Chronic fatigue is an important cause of unexplained absence from school. Children diagnosed through school-based clinics are less severely affected than those referred to specialist services and appear to make rapid progress when they access treatment. Hypothesis: many children with CFS/ME remain undiagnosed and untreated, despite evidence that treatment is effective in children. Research question: are school-based clinics a feasible way to identify children with CFS/ME and offer treatment? 1.0% of enrolled children missed ≥20% of school because of CFS/ME. Fewer than one in five children with CFS/ME had received a diagnosis and been offered treatment. Children with CFS/ME who were detected through school-based clinics were less severely affected than children referred via health services and appeared to do well once treated. Children were offered assessment regardless of how their absence had been classified. All children given a diagnosis of CFS/ME were screened for other medical and emotional causes of fatigue and were prospectively characterised and followed up. School clinics were conducted in three schools in the south west, which has a well-established specialist CFS/ME service. Results may not be generalisable to regions without a CFS/ME service or to regions with different socioeconomic factors that impact on school attendance. 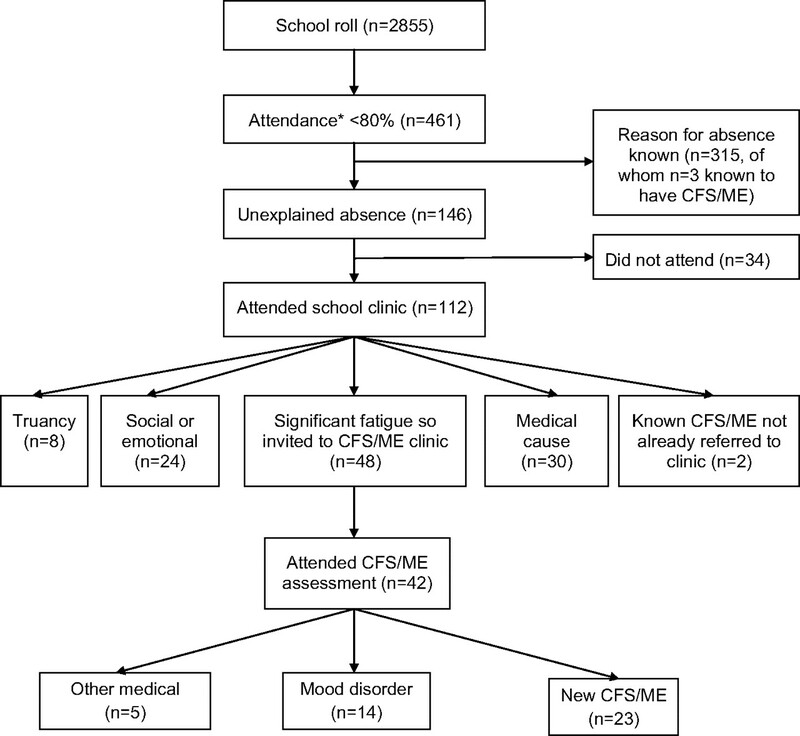 In this paper, we report results from a school-based clinical project to assess children missing school in order to identify undiagnosed CFS/ME, and hence improve access to a paediatric CFS/ME service. This study reports on a pilot clinical service set up with the school attendance service in Bath to try and improve school attendance. The service was offered in three state secondary schools (two mixed gender and one girls only) that were actively working to improve attendance. The attendance officer in each school identified all children in years 7–11 (ages 11–16 years) who had missed ≥20% of school over a 6-week term. Children were excluded if they only had a single episode of absence (eg, a 2-week illness), a medical illness that could reasonably explain the absence, a known hospital admission or were known to have been on holiday or to be truanting. Families of the remaining children were sent a letter from the school that invited them to meet with a paediatrician from the Bath specialist CFS/ME team (EMC) and a member of school staff to discuss why their child was missing school. Children identified in school clinics as having fatigue were invited to attend the Bath specialist CFS/ME service12 at the Royal National Hospital for Rheumatic Diseases for assessment. The Bath specialist paediatric CFS/ME service covers a region in the south west of England with a population of some 400 000 children aged 5–19 years (2001 census) and accepts referrals from schools, GPs and paediatricians. Each year, >200 children and young people are assessed and treated following NICE guidance13 in outpatient clinics unless they are too severely affected to attend clinic, in which case they are seen at home. The following self-completed inventories were collected prior to assessment, at 6 weeks and 6 months: the 11-question Chalder fatigue scale14; the 10-question physical function subscale of the SF3615 (a well-validated health survey questionnaire where the worst physical function scored 10 and good physical function scored 30), a visual analogue pain scale; the Spence Children's Anxiety Scale16 and the Hospital Anxiety and Depression Scale.17 School attendance was recorded at the time of assessment using a single-item inventory. Inventories were coded as missing if >1 question was missing, apart from the Spence Children's Anxiety Scale, which was coded as missing when there were >2 missing items. On the Hospital Anxiety and Depression Scale, each seven-item subscale was excluded if there was more than one question missing. Questions for which two answers were given were coded as missing. Total scores were corrected for the number of missing items. Children who attended the specialist service had a full paediatric assessment including a medical history, examination and screening blood tests as recommended in NICE guidelines13 to exclude other causes of fatigue. A diagnosis of CFS/ME was given using diagnostic criteria recommended in NICE guidelines13 to children who had disabling fatigue lasting 3 months or longer with one additional symptom, where no other cause for the fatigue could be established. Children with CFS/ME were offered specialist medical care, following NICE guidance,13 by the CFS/ME specialist service. All children who accessed the specialist service received advice and help with sleep and activity management. Some children received cognitive–behavioural therapy, while others received graded exercise therapy.13 We used school attendance at 6 months, ascertained through follow-up questionnaires and by review of medical notes, as our primary outcome. We derived exact binomial CIs for proportions. We compared characteristics of children diagnosed as having CFS/ME through the school surveillance programme with those referred via health services using unpaired t tests. Gender between the two groups was compared using the χ2 test. The project was carried out over three school terms between 3 September 2007 and 15 February 2008 for school 1 and over two terms between 31 October 2007 and 15 February 2008 for schools 2 and 3. The school rolls for children in years 7–11 at the time of the study were 925, 1055 and 875 children, respectively (total 2855). Figure 1 shows the flow of children through the study. A total of 461 (16.1%) children were reported to have missed ≥20% of school over a 6-week period during one or more terms. Of these, 315 (68.3%) had only a single episode off school, had a known medical illness that could explain the absence (three of these had CFS/ME and were being seen by the specialist CFS/ME service) or were known to have been on holiday or to have been truanting. The remaining 146 children (5.1% of school roll) had missed ≥20% school without an identifiable cause and were invited to a clinical review at school. Of these, 112 (76.7%) attended the school clinic. Flow of children through study. *Attendance <80% for at least 6 weeks in any term over three terms. CFS/ME, chronic fatigue syndrome. Forty-eight children (42.9% of those assessed and 2.1% of the school roll) described significant fatigue as a major cause of their absence and were given appointments for more detailed assessments at the specialist service. Of the remaining 64 children assessed, 30 had medical problems that explained their absence. These included recurrent headaches/migraines in nine children, infections (eg, tonsillitis, diarrhoea and vomiting or viral upper respiratory tract infections) in eight children, 24 children were missing school because of social or emotional problems, eight because they were truanting and two had a diagnosis of CFS/ME confirmed by a paediatrician but had not been referred to the specialist service. Forty-one children with fatigue attended further outpatient assessment by the specialist service, while one child was severely affected so was assessed at home. Of these, 23 were diagnosed as having CFS/ME that was thought to be the main reason for their reduced school attendance and were offered rehabilitation. Of the 19 children assessed but not diagnosed as having CFS/ME, 14 had fatigue secondary to mood disorders (mostly anxiety and depression). Of these, 11 were referred to local Child and Adolescent Mental Health Services. Five children had other medical problems that were thought to be the cause of their fatigue (sleep apnoea (two), recurrent tonsillitis (one), migraine (one) and undiagnosed sleep disorder not CFS/ME (one)). In summary, a total of 28 children (6.1% of the 461 children who were missing ≥20% of school) had CFS/ME. These included 23 (82.1%) new cases of CFS/ME identified through school clinics, and two (7.1%) children identified as having CFS/ME previously diagnosed by a paediatrician but not known to the school or to the specialist service. Only three (10.7%) children with CFS/ME were already being seen by the CFS/ME service and so were not offered further assessment. The estimated prevalence of CFS/ME sufficiently severe to cause a child to miss ≥20% of school was 28/2855=0.98% (95% CI 0.65% to 1.41%). This is likely to be an underestimate as some of the 39 children who were invited to but did not attend school clinics were likely to have had CFS/ME. Table 1 compares the characteristics of the 23 children identified as having CFS/ME through school surveillance and who attended the specialist service with those of 604 children with CFS/ME referred to the specialist service by a health professional. Children identified through surveillance were less fatigued, had less pain, had fewer symptoms and were less physically disabled than those referred to the specialist service. However, the length of time for which children had been unwell (mean 20.2 months, SD 17.1) was comparable. There was little evidence that levels of anxiety and depression differed between the two groups. Of the 23 children diagnosed as having CFS/ME, four were given advice about managing CFS/ME but did not attend follow-up appointments or return follow-up inventories. Of the remaining 19 children, 12 (63.2%) were attending full-time school by 6 months, of whom six had made a full recovery and were attending full-time school with minimal advice after 6 weeks. One housebound child improved and was attending school part time every day by 3 months. For the remaining six children, school attendance did not alter significantly at 6 months. In school-based clinics, 28 of the 2855 (0.98%) children aged 11–16 years were missing ≥20% of school and were diagnosed as having CFS/ME. Of these, only 3 of 28 (10.7%) had received a diagnosis and accessed specialist treatment. The duration of symptoms in those identified through clinics was comparable to those referred to via health services, but they were not as severely affected. Outcomes following treatment were encouraging. There are several possible reasons why children missing significant amounts of school with CFS/ME are not identified. Those with mild or moderate CFS/ME may not see their GP or may not be recognised as having CFS/ME if they are seen. Alternatively, GPs and paediatricians may not be aware of specialist CFS/ME services or may feel that the child's CFS/ME is not sufficiently serious to warrant a referral. Children referred to the Bath specialist CFS/ME service are more severely affected than those described by other specialist services.12 Differences in characteristics at referral did not appear to be explained by the length of time from symptom onset or co-morbid mood problems. Children were offered assessment regardless of whether their absence had been classified as ‘authorised’ or ‘unauthorised’. This is because fatigue that is causing a child to miss school may have been ascribed to social or educational problems, leading their absence to be classified as unauthorised. All children given a diagnosis of CFS/ME had been screened for other medical and emotional causes of fatigue, were prospectively characterised and followed up with well-validated inventories. Our clinics were conducted in three schools in one city in the south west of England in which there is already a well-established specialist CFS/ME service. The prevalence of CFS/ME, and reasons for school absence, may be different in regions where there is no specialist service and may vary according to the prevalence of socioeconomic factors that impact on school attendance. One of the schools was a girls-only school. A cross-sectional study of British children found little evidence that female gender was a risk factor for CFS/ME diagnosed using the Centers for Disease Control and Prevention criteria or parental report,3 although adult CFS/ME is more common in women than in men.18 If the prevalence of CFS/ME was higher in girls than in boys aged 11–16 years, then we would have overestimated the overall prevalence. We were not able to obtain information on children who did not attend the specialist service for assessment. Surveillance can be justified when improved outcomes in those identified and treated outweigh both harms and costs. NICE guidelines13 recommend that even those children who have mild CFS/ME should be referred to a specialist CFS/ME service after 6 months. There is some evidence that particular treatments (graded exercise therapy and cognitive–behavioural therapy) are moderately effective in children,8–11 while the recently reported PACE trial provided strong evidence that these treatments are moderately effective in adults.24 Large-scale randomised controlled trials are needed in children; however, our finding that more than half (12/23) of children with school-clinic-diagnosed CFS/ME returned to full-time school within 6 months of the start of treatment compares well with results from other follow-up studies,25 suggesting that offering specialist services to children with CFS/ME identified through surveillance may reduce school absence. Nonetheless, it would be of interest to evaluate whether school nurses, rather than doctors, can undertake the initial assessments in school clinics and to conduct randomised controlled trials evaluating the effectiveness and cost-effectiveness of school-based surveillance programmes for CFS/ME. Further studies are needed to investigate the potential for harm in offering surveillance for fatigue to children who do not have a medical diagnosis to explain their absence from school. In conclusion, school-based clinics are feasible and have the potential to identify children with CFS/ME, which may reduce school absence and its harmful consequences. Together with referral to specialist services, school-based clinics have the potential to improve overall school attendance. The authors would like to thank the schools, the attendance officers, young people and their families who took part. The authors would like to thank Peter Shiarly who set up and managed the database. Particular thanks to Larry Cunningham who helped us work with the schools in this project. Royal College of Paediatrics and Child Health. Evidence Based Guideline for the Management of CFS/ME (Chronic Fatigue Syndrome/Myalgic Encephalopathy) in Children and Young People. London: Royal College of Paediatrics and Child Health, 2004.
. Prevalence of severe fatigue in primary care. Arch Dis Child 2005;90:367–8.
. Epidemiology of chronic fatigue syndrome and self reported myalgic encephalomyelitis in 5–15 year olds: cross sectional study. BMJ 2003;327:654–5.
. Incidence, prognosis, and risk factors for fatigue and chronic fatigue syndrome in adolescents: a prospective community study. Pediatrics 2007;119:e603–9.
. Chronic fatigue syndrome and other fatiguing illnesses in adolescents: a population-based study. J Adolesc Health 2004;35:34–40.
. Chronic Fatigue Syndrome: a survey of GPs' attitudes and knowledge. Fam Pract 2005;22:389–93.
. Family cognitive behaviour therapy for chronic fatigue syndrome: an uncontrolled study. Arch Dis Child 2002;86:95–7.
. Family-focused cognitive behaviour therapy versus psycho-education for chronic fatigue syndrome in 11- to 18-year-olds: a randomized controlled treatment trial. Psychol Med 2010;40:1269–79.
. Interventions for the treatment, management and rehabilitation of patients with chronic fatigue syndrome/myalgic encephalomyelitis: an updated systematic review. J R Soc Med 2006;99:506–20.
. Graduated exercise training and progressive resistance training in adolescents with chronic fatigue syndrome: a randomized controlled pilot study. Clin Rehabil 2010;24:1072–9.
. Cognitive behaviour therapy for adolescents with chronic fatigue syndrome: randomised controlled trial. BMJ 2005;330:14.
. Association between school absence and physical function in paediatric chronic fatigue syndrome/myalgic encephalopathy. Arch Dis Child 2009;94:752–6. NICE. Chronic Fatigue Syndrome/Myalgic Encephalomyelitis (or Encephalopathy); Diagnosis and Management. CG53. London: National Institute for Health and Clinical Excellence (NICE), 2007.
. Development of a fatigue scale. J Psychosom Res 1993;37:147–53.
. The MOS 36-item short-form health survey (SF-36). I. Conceptual framework and item selection. Med Care 1992;30:473–83.
. Psychometric properties of the Spence Children's Anxiety Scale with young adolescents. J Anxiety Disord 2003;17:605–25.
. Normative data for the HADS from a large non-clinical sample. Br J Clin Psychol 2001;40:429–34.
. Risk factors for chronic fatigue syndrome/myalgic encephalomyelitis: a systematic scoping review of multiple predictor studies. Psychol Med 2008;38:915–26.
. Long-term sickness absence due to ME/CFS in UK schools: an epidemiological study with medical and educational implications. J Chronic Fatigue Syndr 1997;3:29–42.
. Frequent medical absences in secondary school students: survey and case-control study. Arch Dis Child 2009;94:763–7.
. Prevalence of chronic disabling fatigue in children and adolescents. Br J Psychiatry 2004;184:477–81.
. From child health surveillance to child health promotion, and onwards: a tale of babies and bathwater. Arch Dis Child. Published Online First: 3 April 2011. doi:10.1136/adc.2010.186668.
. School absence: a problem for the pediatrician. Pediatrics 1982;69:739–46.
. Comparison of adaptive pacing therapy, cognitive behaviour therapy, graded exercise therapy, and specialist medical care for chronic fatigue syndrome (PACE): a randomised trial. Lancet 2011;377:823–36.
. The prognosis of chronic fatigue and chronic fatigue syndrome: a systematic review. QJM 1997;90:223–33. Funding This work was supported by the Linbury Trust Grant number LIN 1750. The funders did not take part in the collection, analysis or interpretation of the data and have not been involved in writing this article for publication. The researchers are independent from the funders. Competing interests The authors declare that (1) EMC, AME and JACS did not receive any financial support from companies for the submitted work; (2) EMC, AME and JACS have no relationships with any companies that might have an interest in the submitted work in the previous 3 years; (3) their spouses, partners or children have no financial relationships that may be relevant to the submitted work and (4) AME and JACS have no non-financial interest that may be relevant to the submitted work. EMC is a medical advisor for the Association for Young people with ME (AYME). Ethics approval The clinical service in this study was provided as an outreach from the Bath specialist CFS/ME service. The North Somerset & South Bristol Research Ethics Committee decided that the collection and analysis of data from children and young people seen by the CFS/ME specialist service were part of service evaluation and as such did not require ethical review by the NHS Research Ethics Committee or approval from the NHS R&D office (REC reference number 07/Q2006/48). Contributors EMC conceived the idea for this study, conducted the school clinics, analysed the data with support from JACS and wrote the first draft of the paper. AME contributed to writing and the interpretation of the data helping to critically revise the paper. JACS helped with the analyses and contributed to writing the paper. All authors read and approved the final manuscript. All authors had full access to all the data in the study. EMC will act as guarantor for this paper.